The letter petitioning the Chief Herald of Canada for a Grant of Arms. ​The first meeting of the Grant of Arms Committee was held on January 2nd, 2010, in the "Kirk Room" of the Royal Coachman in Waterdown. At this initial meeting four key themes were identified by the committee for representation in the arms and flag: Trees, Water, People and Growth. Throughout 2010 and 2011 meetings were held across Flamborough in an effort to be as inclusive as possible. Thanks to a wonderful partnership with the Flamborough Review, numerous articles were published encouraging people to offer their suggestions to the committee. All schools in Flamborough were encouraged to have their students participate in a contest to create a motto for Flamborough (ultimately created by committee member Kyle Menegaldo after combining submissions from Greensville Public School and Rehoboth Christian School). The three rough sketches provided by Dr. Forrest Pass for the Grant of Arms to discuss at the Carlisle Golf & Country Club meeting held on April 11th, 2010. Ultimately, design #3 was selected. On September 14th, 2009, the Flamborough Heritage Society formally petitioned Claire Boudreau, Chief Herald of Canada, for a Grant of Arms which would ". . . reflect the former Town of Flamborough and its rich heritage so that we can better educate residents in the region." The Chief Herald accepted the petition and assigned Dr. Forrest Pass, Saguenay Herald, to the file. 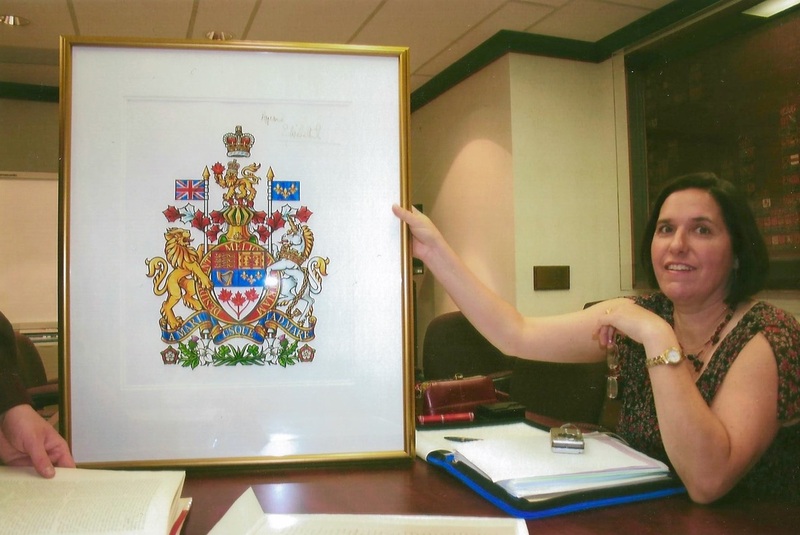 Committee member Kim Janjic holds the original artwork for the most recent rendering of the Queen's Arms in Right of Canada during a visit to the Canadian Heraldic Authority in Ottawa on June 11th, 2010. 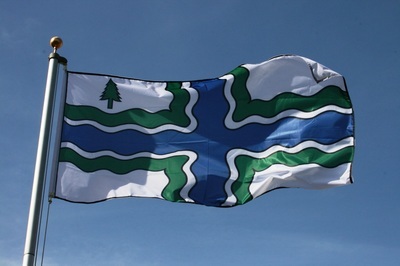 The first rendering of the Flamborough Flag. Drawn on June 13th, 2010. 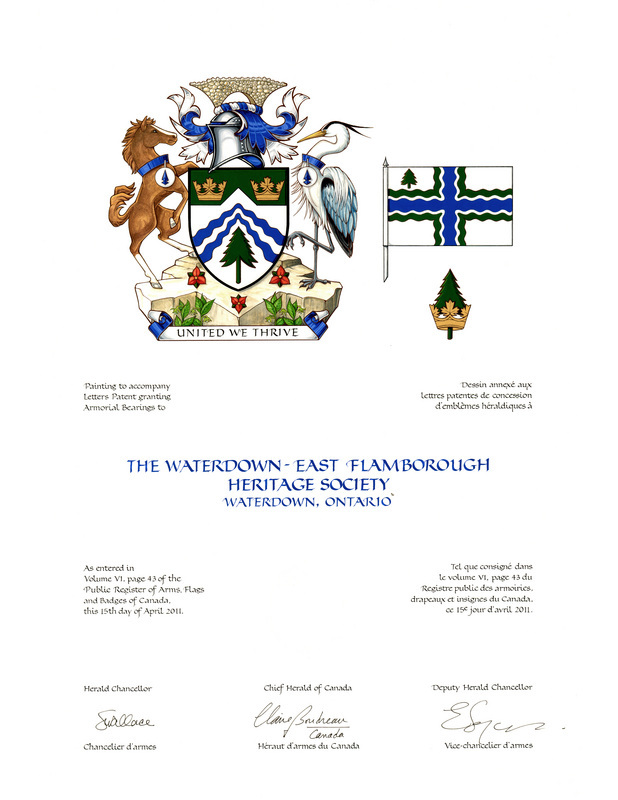 On April 15th, 2011, the Chief Herald of Canada (exercising the Royal Prerogative) granted arms, as well as a flag, to The Waterdown-East Flamborough Heritage Society that would reflect the historical Town of Flamborough (since Flamborough is no longer a municipality, it could not be granted the arms directly). The arms and flag were presented to the community on April 29th, 2011, by the Right Reverand Bishop Ralph Spence, Albion Herald Extraordinary, at the Carlisle Golf & Country Club. 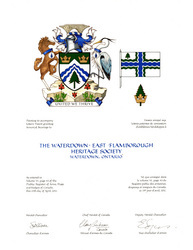 The Flamborough Grant of Arms was published in the Canada Gazette (Vol. 145, No. 46) on November 12th, 2011. 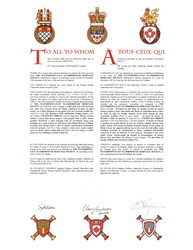 Since early 2016, the original Grant of Arms presented at the Carlisle Golf & Country Club has hung in the Flamborough Archives in the Waterdown Branch of the Hamilton Public Library. The most important part of any coat of arms is the shield. The other elements around the shield are optional, however, they need to follow very strict guidelines of heraldic design. 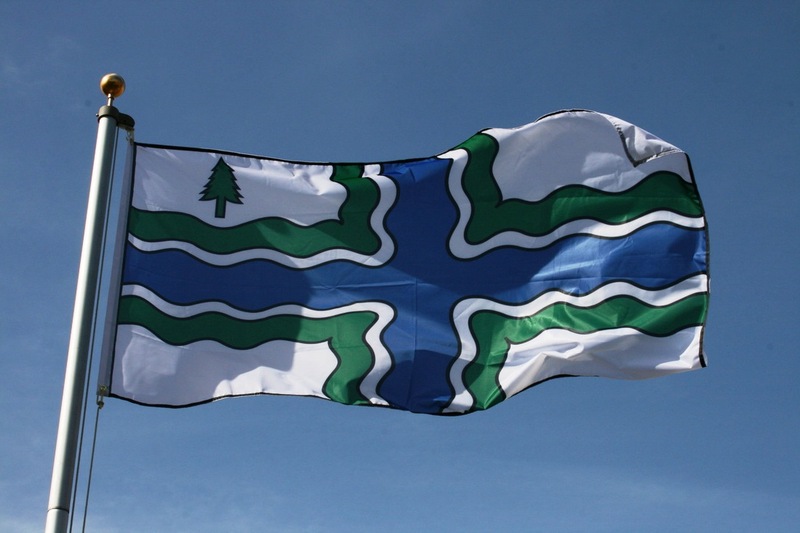 The Shield: A white shield with a green pine tree between two blue wavy triangles, rising from the base with their points converging toward the top of the shield. The top portion of the shield is green with a triangular notch in the middle, pointing upwards, charged with two gold crowns of maple leaves. This section recalls the dormer of an Ontario Cottage, a nineteenth-century vernacular architectural style common throughout Flamborough. A dormer also appears in the logo of the Waterdown-East Flamborough Heritage Society. The shape also recalls a plough moving through green turf, a reference agriculture and the early pioneers of this area. The coronets depict the human history of the area, as well as its connections with the British and Canadian Crowns. 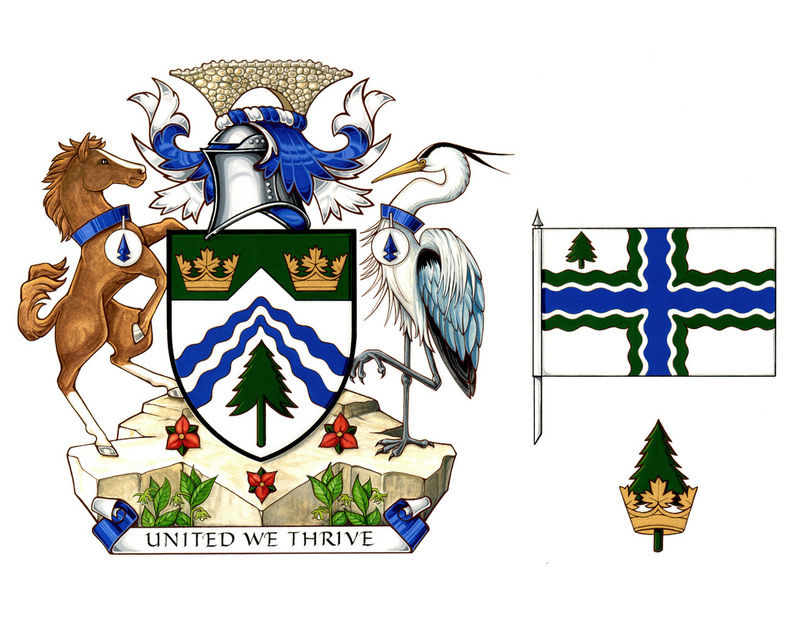 The pine tree appeared on a number of previous seals and arms of Flamborough's communities and represents the white pines that use to dominate the landscape. The four wavy lines represent the four major wateways (Grindstone, Bronte, Spencer and Fairchild Creeks) and waterfalls (Webster’s, Tews, Borers and the Great Falls) of the region. 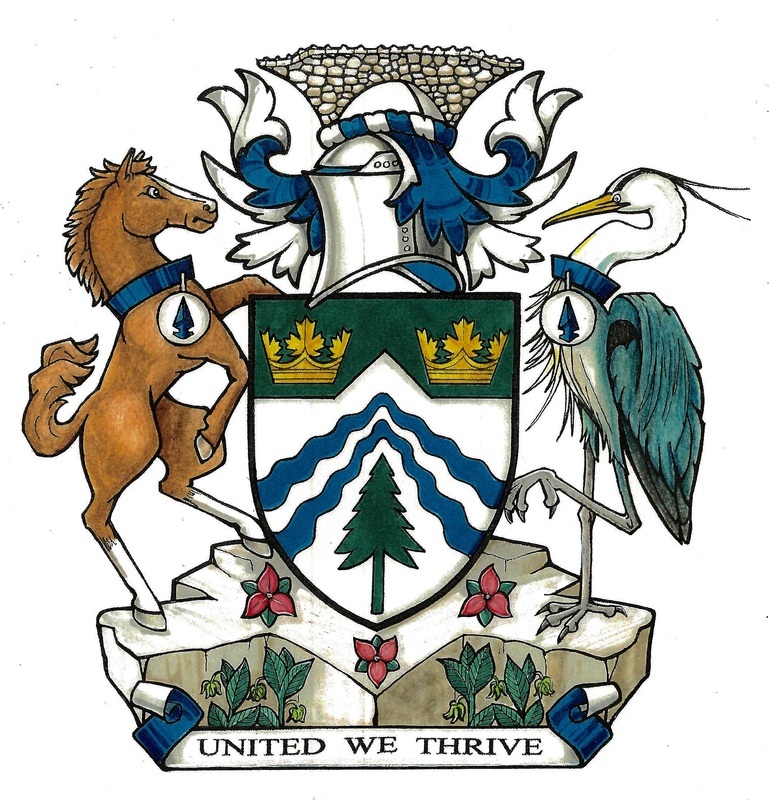 By their convergence, they also represent the amalgamation of the three townships with the village of Waterdown to create the Township (later Town) of Flamborough in 1974. Crest (top of the coat of arms): A representation of the "Cobblestone Bridge" at Webster's Falls - a major landmark in the Flamborough region. Motto: "UNITED WE THRIVE" - developed by students from Greenville Public School and Rehoboth Christian School, as well as Kyle Menegaldo. Supporters (animals on either side): On the left side of the shield is a horse and on the right a great blue heron. Both are wearing a medallion around their necks, depicting a blue arrowhead. They stand on a platform representing the Niagara Escarpment, charged with three red trilliums rising from a bed of green violets. The horse symbolizes the early pioneers of the Flamborough area and the continuing importance and contribution of agriculture. It also illustrates the importance of the horse in development of the area and is also a reference to the iconic Rockton World’s Fair. The Great Blue Heron is a common sight in the area marshes and along the waterways of the community. In particular, the heron represents the Beverly Swamp. The arrowheads reflect the Indigenous identity of the region, recognizing that the Flamborough region is within the traditional territory of the Chonnonton, Haudenosaunee, Wendat and Mississaugas of the New Credit Nations. The eastern green violet represents the Beverly Swamp, which is home to a provincially significant concentration of the rare flower. The trillium is the provincial flower of Ontario and the red variety is found in abundance in the Flamborough area. The number of trilliums represent the three areas (Dundas, Aldershot & Clyde) that have been annexed from Flamborough by surrounding municipalities (except Dundas which became independent). The Flag is a reinterpretation of the arms, focused at the centre to recall the motto. 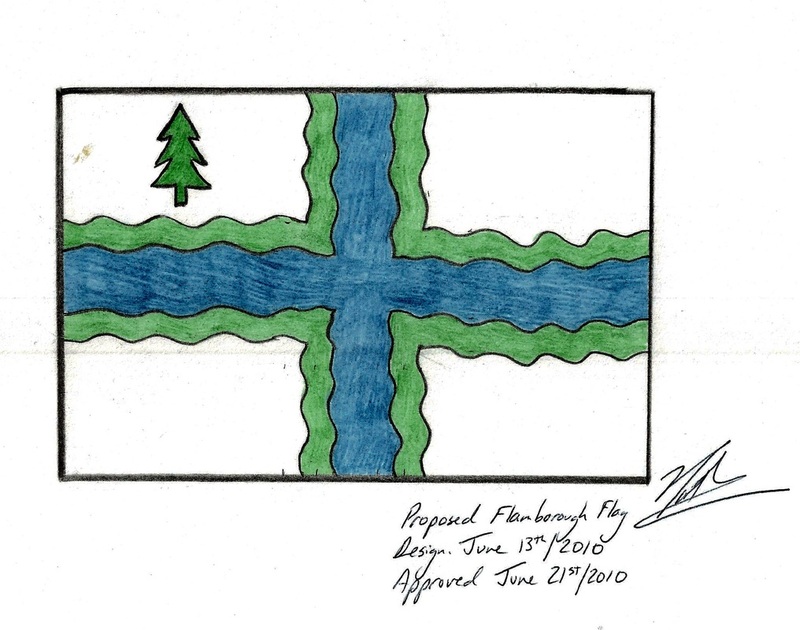 Purposely divided into four parts, the flag represents the waterways, waterfalls and original townships of this region. 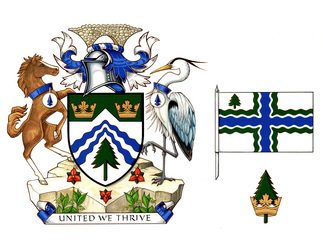 The colours of the flag, as with the arms, are the same used by Flamborough when it was its own municipality (1974-2001).